How true purpose—beyond financial gain—leads to meaningful accomplishments in business. Andrew Limouris believes purpose can lead to satisfied employees, increased revenue and unified teamwork. He’s delivered impressive results as CEO of Medix, an international staffing company, and now helps other leaders and teammates find purpose, too. Andrew’s strong belief inspired him to author the book, Won With Purpose. Andrew Limouris believes it can lead to satisfied employees, increased revenue and unified teamwork. 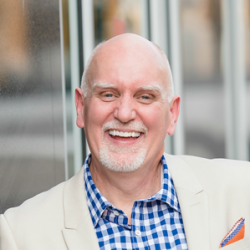 He’s delivered impressive results as CEO of Medix, an international staffing company, and now helps other leaders and teammates find purpose, too. Andrew Limouris strives to cultivate purpose in everything he does within business, coaching his youth football team and in life. As CEO of Medix, Andrew is grateful to be in a position that drives true impact. Medix specializes in recruiting skilled professionals for clients in healthcare, science and IT. After discovering Medix’s core purpose of positively impacting lives, he promoted the idea of a “double bottom line” that prioritizes profit and purpose. Learn more. Accomplishments are more significant when you see the big picture through the lens of purpose. Elevating others to find deeper meaning in their actions is rewarding. 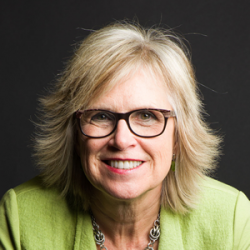 When you lead a purpose-driven team, you’ll see genuine passion, dedication and focus. When purpose radiates, positivity quickly follows. Interested in having Andrew keynote your event? Who should get serious about finding their purpose? Take a turn off the status quo, and learn how purpose can elevate your team, goals and bottom line. As you take the next steps in your career, make sure purpose is a part of your path to see true success. Help your team see that it’s not just about winning. There’s more victory on and off the field. Purpose doesn’t need to come from the top down. Find purpose in your day-to-day work, and your achievements will become more meaningful. Purpose lives beyond work and sports. Find it in everything you do day in day out. You’ll discover genuine happiness. 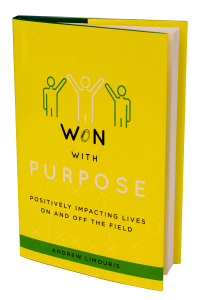 Download a free preview of Won With Purpose below! Preview the first three chapters of Andrew Limouris’s journey to find how his purpose can help you start your own journey. The beginning of a purposeful life starts now. 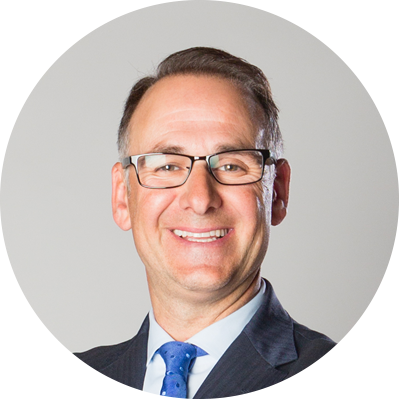 Meet Andrew Limouris, Founder, President and CEO of Medix. Andrew Limouris is the founder, president, and CEO of Medix, an international staffing organization specialized in recruiting skilled personnel in the healthcare, science, and IT. He founded the company based on the mission and purpose of positively impacting lives and strives to recruit others who live the company’s core values. Inavero’s Best of Staffing Client & Talent Awards for two consecutive years. He was also honored as a Midwest Ernst and Young Entrepreneur Of The Year® in Technology and Talent Services. Andrew received his bachelor’s degree in speech communication from Ripon College. 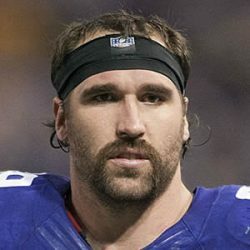 Today, he lives in Illinois with his wife and their three children. Along Andrew’s journey of purpose, he’s had the opportunity to connect with leaders of all kinds to learn more about the ways that purpose can drive success. In this podcast series, Andrew interviews inspirational individuals—from business leaders to athletes of all sizes to non-profit volunteers—to hear their stories of purpose, and share with listeners ways that they can find purpose in their own lives. Andrew Limouris found true success when he discovered purpose in business and coaching. Uncover your purpose and find meaning at work, on the field or in your day-to-day life. 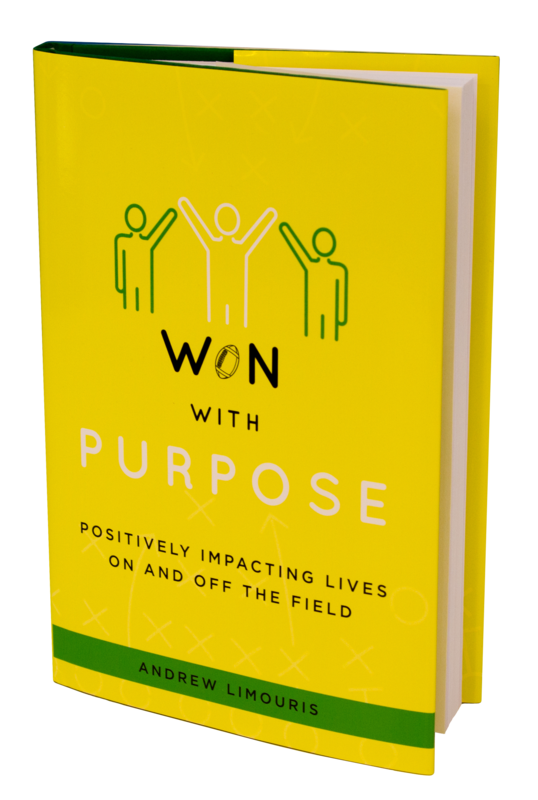 All proceeds from Andrew Limouris’s book, Won with Purpose, will be donated to Ann & Robert H. Lurie Children’s Hospital of Chicago’s CHASE Your Dreams program! To learn more about CHASE Your Dreams, please visit www.luriechildrens.org/en/serving-the-community/advocacy/mentoring.